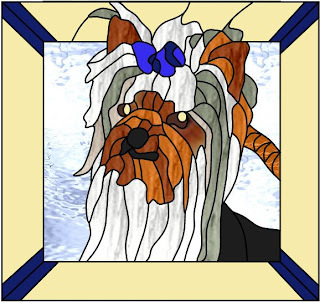 As a result of being a member of StainedGlassville, the PREMIER website for glass artists, our illustrious host Gary spread the word about a self publishing website called LULU.COM. Several other members who are hugely talented design artists have also created pattern books that are currently for sale on Lulu.com. If you haven't checked this site out please do. This book contains the top 10 dog breeds for the year 2008, plus a few that are not in the top ten but that I'm particularly fond of. 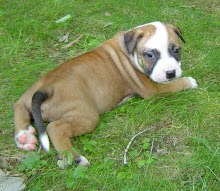 Some are dogs I've grown up with, friends dogs and our current breed of choice, The American Staffordshire Terrier. I certainly hope that everyone enjoys these patterns just as much as I enjoyed creating them. 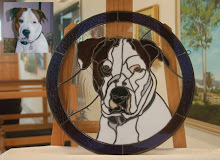 I'd like to think that they are some of the more realistic depictions of the dog breeds that have ever been created in stained glass.